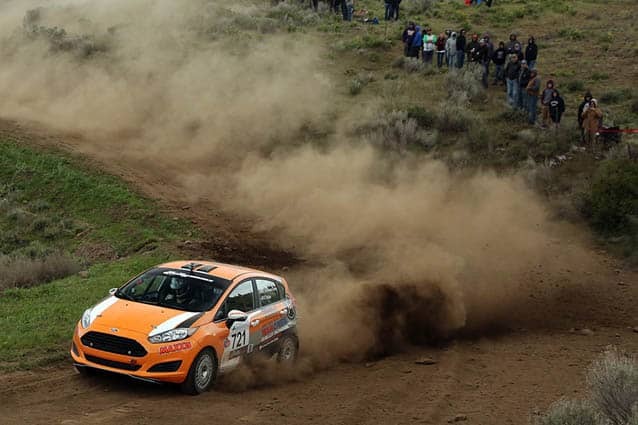 Keanna Erickson-Chang corners a dirt section of track in her EcoBoost Ford Fiesta. As sports stars go, if you think of Killington, you think of snow-sport athletes. In the case of Keanna Erickson-Chang, you would be wrong. The 21-year-old discovered competitive auto racing instead and has recently competed in the 2016 Rally America National Championship in Portland, Ore. Next stop: the Olympus Rally in Shelton, Wash.
“She’s a local girl who didn’t have much interest in sports,” said her father, Andrew Chang. Chang said his daughter hasn’t looked back. So far this year, Erickson-Chang has competed in Michigan and Missouri, and she is scheduled to race in Pennsylvania, Maine, and Minnesota, among other states. She is booked to race until at least October. Erickson-Chang’s most recent event took place at the Oregon Trail Rally at the Portland International Raceway. The event started on a mix of dirt, gravel, and asphalt, and it contained man-made jumps. The race moved to mountainsides in Oregon and Washington State, where competitors raced 115 miles on mostly gravel roads, clocking 335 miles total. Speeds sometimes topped 100 mph. Erickson-Chang drove a 1.0 litre EcoBoost Ford Fiesta in B-Spec. With her navigator, Ole Holter, she won the final stage. The pair finished second in class following their second place finishes in February at the Rally in the 100 Acre Wood (Potosi, Mo.) and at Sno*Drift Rally (Atlanta, Mich.) in January. Chang said nobody ever saw this coming. Anyone wishing to keep up with Erickson-Chang’s racing career can follow her at www.keannaericksonchang.com.